To anyone who had a passing knowledge of the nature of color revolutions and destabilization efforts in years past, the recent protests in Ukraine were an obvious example of foreign meddling in the domestic affairs of yet another Eastern European nation. From the initial spates of violence coming largely from the direction of the protesters to the pro-EU and pro-IMF demands, it was clear from the very beginning that the Ukrainian people were being callously pulled back and forth between two world powers indifferent to any interests but their own. These powers, the United States and Russia, have been covertly jockeying for more and more control over Ukraine, a strategic location for both countries, for the last several years. Yet, as the United States’ power and influence begins to wane and Russia’s begins to increase on the world stage, the risk of both powers clashing over Ukraine in a direct fashion becomes a bigger possibility by the day. While tensions between the United States and Russia have escalated over the last three years through the Syrian crisis, Ukraine is more than a simple sphere-of-influence region for Russia. It is a sphere-of-influence region that borders the homeland. For this reason alone, the level of importance attributed to Ukraine by Russia is obviously higher than that of Syria in the long run. Interestingly enough, it is for this same reason that the United States considers Ukraine such a vital sphere-of-influence nation as well. 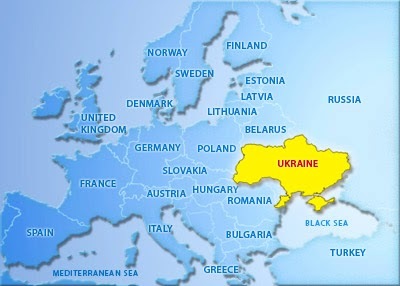 That is, the fact that Ukraine lies on the doorstep of Russia. Although the reasons for considering Ukraine an extremely important part of the world by both the United States and Russia cannot simply be boiled down to that of a border issue, the fact remains that the potential for a direct collision between two world nuclear powers is a possibility if the meddling continues. In the meantime, as the Ukrainian people are being used as battering rams for the will of world elites, they are quite clearly the guaranteed loser no matter what decision is made. With the recent success of the Western-backed color revolution, what is also clear is that the only winner in Ukraine is austerity, Fascism, the IMF, and, of course, the world elites. International bankers, as usual, are salivating over the coming feast that will come at the expense of the living standards of the Ukrainian people and the coffers of the Ukrainian government. Even before a ruling government can be formed by the leading color revolutionary leaders Yatsenyuk, Klitschko, and other relevant agents of destabilization, the acting President, Oleksander Turchinov, is stating that European integration is a high priority of the new government. This, of course, means that Ukraine will soon move forward in becoming a full-fledged member in good standing of the new European Soviet known as the European Union. In addition, leading contender for the post of Prime Minister, Arseniy Yatsenyuk, and the Parliamentary leader of the Fatherland Party, is now calling on the rest of Parliament to immediately come to agreement on a new government so that Ukraine can now crawl to the International Monetary Fund for “emergency economic assistance.” As one may expect, the IMF has already declared that it will require harsh austerity measures and other “economic changes” in exchange for any aid to Ukraine. The $15 billion bailout package provided by Russia to Ukraine in December has now been suspended, placing Ukraine in imminent danger of default. The Hryvna, the Ukrainian currency, has been sharply devalued and the country’s bond rating has been downgraded in such a dramatic fashion that Ukraine is no longer able to borrow on international markets. Foreign reserves have also dropped dramatically. If conditions persist, Ukraine will soon no longer be able to pay public pensions and salaries. Yet austerity is not the only result of the recent Ukrainian “revolution.” Subtle and even outright Fascism has come to dominate not only the demonstrations themselves but the relatively young “transitional” phase now taking place. Indeed, this relatively new trend of Fascist rule was enunciated in a recent statement by Natalia Vitrenko of the Progressive Socialist Party of Ukraine, a party that asserts its opposition to both the Orange Revolution installment of Yuschenko as well as the polices of Yanukovych. Washington and Brussels should hear our warnings. We hold them responsible for all they have done to transfer power to the political forces responsible for establishing this totalitarian Nazi regime in Ukraine, with the inevitable gross violation of the rights and freedoms of millions of our fellow citizens. The U.S. and EU should know that this power grab by political parties and movements including neo-Nazi forces (such as “Svoboda – Freedom” and “Right Sector”) , announced the implementation of a national revolution under the slogans “Ukraine for Ukrainians,” "Glory to the nation – death to enemies," "Muscovite tools and Communists to the gallows!" and others. Starting on February 22, this new government must assume all responsibility throughout Ukraine for the violation of the rights and freedoms of citizens. Insurgents and terrorists continue to capture Euromaidan administrative buildings and local authorities in the South and East of Ukraine. Using terrorist methods, voters have been deprived of their rights and of the authority of their elected representatives in local councils. Civilians defending their choices have been mercilessly shot by gunmen armed with Kalashinkovs, rifles, and other combat weapons, as for example on February 22 in Lugansk. Militants not endowed with any legitimate police authority have arrogated emergency police powers to themselves, using axes and sticks to block central thoroughfares, halting cars to carry out inspections and verification of documents of passengers, and arresting people. They have blocked the entrance to the airport and thus grossly violated the European Convention on Human Rights and Fundamental Freedoms, which guarantees the inviolability of the person, freedom of movement, the presumption of innocence, and the right to security and life. All the people of Ukraine have been humiliated and denied their dignity and rights. Already on February 23 representatives of the new government announced the formation of the Ukrainian nation: they proclaim that anyone who uses the Russian language will be subjected to deprivation of their native-born status of Ukrainian ethnicity and will be discriminated against in civil and political rights. The new regime has already announced their intention to ban the broadcast channels of the Russian Federation on the territory of Ukraine, branding them as the TV channels of a hostile state . This is the way the new government defends the European values of freedom of speech and freedom of the press. The regime is preparing lists of enemies who are subject to proscription. This mechanism will deprive of civil and political rights all those who do not share the neo-Nazi views of the new Ukrainian authorities. Across the country, ghoulish lynchings continue. People are being beaten and stoned, while undesirable members of the Verkhovna Rada of Ukraine are subject to mass intimidation and local officials see their families and children targeted by death threats if they do not support the installation of this new political power. The new Ukrainian authorities are massively burning the offices of political parties they do not like, and have publicly announced the threat of criminal prosecution and prohibition of political parties and public organizations that do not share the ideology and goals of the new regime. In other words, those few participants who at first joined the movement to fight against government corruption and for whatever they perceived to be a better political structure or simply those that were paid to fight in the streets, have been pushed out of the movement after the seizure of power was accomplished. In their place are the more militant wings of the movement such as the political parties mentioned above and the brutal thugs sanctioned by Western governments. In the end, with the full support of the West, particularly the U.S. State Department, the recent successful “regime change” effort in Ukraine still has the potential to turn into an explosive situation in the literal sense. Aside from the moral qualms of allowing foreign powers the ability to dictate to smaller states the political direction which they must take, provoking a confrontation between two major world powers – both with nuclear capability – is a recipe for disaster. From Syria to Ukraine, a new geopolitical race has been initiated with a clear destination firmly in the minds of the world political elites currently directing both sides of the contest. That direction, while potentially beneficial for those in positions of power, spells nothing but destruction for the rest of us.